Moss serves a valuable ecological role. It helps control erosion, filter rainwater, repair damaged ecosystems, and even promote growth. In years past, moss has been appropriated to hold many domestic functions as well. It was used to fill chinks in log homes, to insulate boots and mittens, and it was even used in World War I as bandaging—because it’s said to absorb liquids three times faster than cotton and have antibacterial properties. While this all may be true, moss has little value when it’s growing on your roof. In fact, moss can have adverse effects on your roof and home. 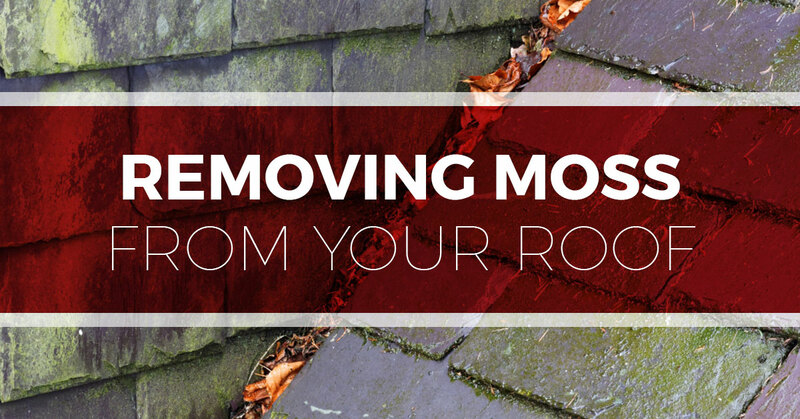 When moss grows, it absorbs and retains moisture that rests on the surface of your roof. When not taken care of, this can lead to debris buildup and ultimately rot, which can significantly compromise the functionality and integrity of your home. With this post, we at Tim Leeper Roofing hope to fill you in on mossy roofs—explain how it happens, how to deal with it, and how it can be prevented in the future. If you fear your home has been damaged by moss, call Tim Leeper Roofing. We can give you the roof inspection you need! Moss thrives in wet, shady areas. Naturally, the parts of your roof that receive little to no sunlight, like shady, North-facing areas, are prone to moss growth. Starting with a thin, green dusting, moss can quickly take over a roof. Even the tiny area between shingles and their edges can foster the growth of moss. When this happens the moss can start to push the shingle up— almost like a natural jack—allowing water to seep underneath and cause wood rot, leaks, and ultimately necessitate a roof replacement. There are an array of commercial cleaning solutions as well as DIY solutions for removing moss from your roof. Most local hardware stores and home centers offer an array of effective and reputable cleaners. Popular DIY solutions typically include a mixture of bleach and water or vinegar and water. Whichever option you choose, follow the directions and remember that your safety is of the utmost importance. Also, keep in mind that some solutions require that the solution is left on for a specified period of time, while others call for a rinsing almost immediately after scrubbing. Reduce the Shade – this can be difficult given the fact that the shade thrown onto roofs typically comes from big surrounding trees. However, sometimes a total removal isn’t necessary to reduce the shade. Trimming tree branches can often give the roof the sunlight it needs to hinder the growth of moss. Just a few hours of sunlight may be enough to prevent moss from forming. Keep the Roof Clean – this is a perhaps the easiest way to prevent moss buildup and damage. When you start to notice a green dusting on your roof, get proactive and eradicate it. Depending on the size of the area, it’s worth noting that moss only grows in a 5 to 6 pH range. Therefore, a simple solution containing a more base or acidic level can hamper the growth of moss. Do keep in mind that acids can erode your roofing, so dilution is required. Common acids include distilled vinegar, orange juice, and lemon juice, and common bases include baking soda, baking powder, bleach, etc. These can be directly applied to the area, causing near immediate removal and short-term prevention. Perform Regular Roof Inspections – residential roofing inspections are an integral part of maintaining a quality roof. For example, when a certified, experienced roofer from Tim Leeper Roofing comes to inspect your roof, you can guarantee that we’ll not only alert you of any potential moss-related issues, but we will also give your roof a thorough inspection and pinpoint any potential problems. The whole point of taking charge and proactively dealing with moss is to protect one of the most important parts of your home—your roof. When dealing with moss be sure to not further damage your roof. Taking part in any of these harmful practices can severely affect the integrity of your roof. Do Not Pressure Wash Your Roof – sure, pressure washing will likely knock the moss right off. But in doing so, it will also remove the asphalt shingle granules, which are vital components to the shingles’ life and functionality. Do Not Scrape Moss Off – when you use a tool to scrape off moss and debris, you can crack, rip, and damage the asphalt shingles. Instead of using a type of scraping instrument, use a bristled brush. And when you scrub, work from top to bottom. Scrubbing upwards can pry and loosen shingles. Do Not Spray Water Upward – if you are using water to remove the moss, be sure not to spray from below or at an upward angle. This can be especially damaging if the moss growth is already beginning to lift up the shingles. Spraying at an upward angle will pry up shingles and allow water to go under the shingles, causing leaks and/or rot to the wood decking. This will also make them more prone to coming loose when strong winds roll through. A green, moss-covered roof can give a home a cozy, fairytale-esque look. However, functionally speaking, your roof will be far from a fairy tale. Moss allows for debris buildup that fosters water buildup, and it can actually cause the shingles to breakdown faster, leading to rot and leaks. If you have a moss problem on your roof and are worried your roof may require professional maintenance, contact Tim Leeper Roofing. We are trusted and professional roofers who take pride in being Nashville’s Top Rated roofing contractors. Whether you are looking for commercial or residential roofing repair or replacement, contact Tim Leeper Roofing to get your free quote today!